Thank you to everyone who has already joined in with my Memory Monday meme. I 've seen some fab posts. I'm sticking with the 70's again today and I'm taking you back to my childhood. This is me aged 5 or 6. I am on a beach in Wales though you would never have guessed that due to the fact that the sun is shining. I'm clearly having fun - or pulling faces because I don't like the sand in my pants... (still don't in case you wondered), but on the whole this is a happy scene. Now this is where things turn dark. I was a thumb sucker and I had the manky of mankiest ribbons that had many years ceased to be the blanket it once was, but I loved it and I took it everywhere with me. My parents were desperate to part me from my beloved smelly ribbon but I was having none of it. We were holidaying with family friends and the family friends had a dog. Lets call him Bob in the interest on non disclosure. I liked Bob - we had been playing together on the beach for most of the day. 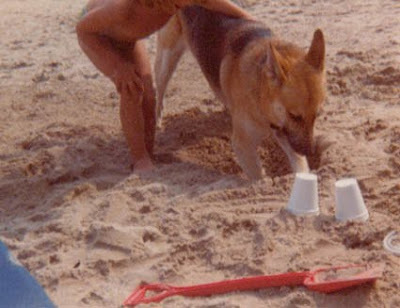 I'd been having fun letting him knock down my coffee cup sandcastles and watching him dig. Then things got bad. Very very bad. As we packed up our belongings to head back to the car I felt a huge surge of panic. My silky ribbon was gone. I cried and I sobbed for days. I was anxious and I couldn't sleep. I wanted my ribbon back with every inch of my being. 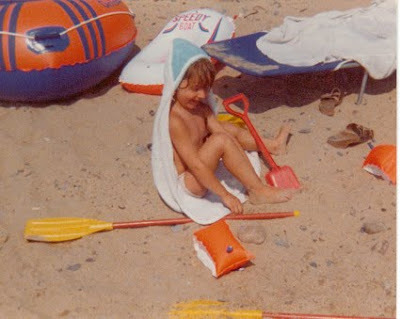 Then one morning the holiday photographs flew through the letterbox (shows how long ago this was... post, morning??) and as I sat on my mums knee looking through them she started to chuckle. "Look.." she said "I managed to get a shot of Bob burying your ribbon." I looked at her - I thought she was joking but she clearly wasn't. I know that I was only five but something changed between us that day and the feeling I had as she chuckled has always stuck with me. My crew have all had their attachments. In just about every photo that I have of Sonny's pre school years he has his thumb in his mouth and his Cuski draping over his shoulder. ModelGirl has her cot quilt that she still sleeps snuggled up in even though she is eight and FunnyGirl has a bit of a thing for all things silky..... but we'll talk about that another time.. I've never felt the need to take their comforters away - especially as I gave it to them in the first place. I know that they will give it up when the time is right for them but I have other parent friends that have resorted to the same drastic measures as my mum did. It seems to be quite a contentious issue - but what do you think? Is there a right time to ditch the dummy or blanket and how will you go about it? You don't need to be tagged to join this meme just let me know so that I can link to you. Oh my gosh I would have been mortified! I'd say leave em to it! I still have my towelling 'ticky' which has no towel left on it, it is but merely weave! Mo and i fight over it!! The only comforter I think does need to be got rid of is a dummy due to stunting language development, moving teeth and causing speech impediments. monty had one but I made sure it was gone by 18/20 months ish for those reasons, but now he has his 'ticky's' like Mummy and is attached to about 3 soft toys. What a great post. Love the photos. Have you forgiven your Mum yet? I don't think I ever had a comforter but my baby sister did - the silky edge of one of those cot blankets. The number of times we had to turn around en route on the motorway because we'd forgotten blankie. I think I finally managed to make her give it up one Christmas Eve when she was about 5 when I told her Father Christmas would think she was a baby if he saw her with it. And she never had it again. I've purposely got my 2 year old attached to a toy rabbit. Now I'm kicking myself. I love the old 70s photos, loving your blog too, very glad i've found you. rather jealous of your Blythes, I only have a petite and still waiting for my real one. How many hints can a girl drop to her OH ;). A Hello Kitty fan too, you're my kind of girl. I was a thumb sucker too and I had my own ribbon. It was a bit of the silk edge of the blanket my mom wrapped me in as a baby. I called it "Wuggie". I still have Wuggie preserved in my scrapbook. Once my mom accidentally sucked Wuggie up in the vacuum. Very traumatic. My mom cut open the vacuum back and fished Wuggie out. That's just mean to let a dog bury your lovie! Am loving the Monday Memes! Have given you an award at my blog for them!! what a mean-o! she was probably just following public opinion of the time in the same way that time-out was in, and is now not de-rigour. and i'm sure gina f will have her day! I am not sure actually. I remember that my uncle threw my sister's favourite blanket out of the car window on the motorway because he thought she was too old for a comforter and I find this really cruel. My two have a dummy and muslin. Elliott is now 3 and still sleeps with the dummy although he has given it up during the day. Victor on the other hand is obsessed with dummies. He regularly has one in his mouth and one in each hands. That gets me slightly more worried, but I am not loosing sleep over it. I am sure it will all happen in good times. hello, late comments but just found you! We jusy got rid of pacifiers though (my girl is 4, and she decided, with a little encouragment. On advice of the dentist we just took it frm my 2 year old boy at the same time.) But they both still have their silky blankets. My name is Robert Wheeler I was browsing internet and found your blog. The author did a great job. I will subscribe to your RSS feeds. Thank you for your contribution. I am a web designer myself. And here some examples of the websites that I designed for cash advance payday loans in canada company.